This is an easy kid’s craft project for Halloween, so why not make a few of these cute pumpkin people to hang on the fridge or in your car window? Print out your pattern or just draw a circle with the stem, and a leaf. Trace onto felt, and cut out. 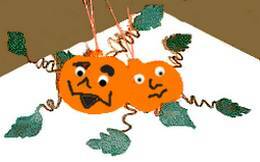 You will need two orange pumpkins and four leaves for each pumpkin person. Place one cotton ball in the center of the pumpkin and glue in the chenille stems (or pipe cleaners) one for the arms and one for the legs. Glue the other pumpkin on top of the first one. Don’t forget to turn one pumpkin on the other side so that they will match. You may also use some clothes pins to keep the pieces together until your glue take hold. Add the eyes – if the ones you have are self-adhesive, just remove the backing paper and apply, but if not, add a dot of glue to the back of the eyes, position in place, and allow to dry until the eyes are securely fastened. Draw on a scary or happy face with permanent marker. Bend your pipe cleaners in a zigzag and glue on the leaves for hands and feet. Attach a string on the top and hang them around the house, on the fridge, on in the car.